Our classrooms are chosen to support the children: The Threes room is designed with their size in mind to be cozy, reassuring and accessible. The Fours rooms are larger with more opportunities for varied, revolving activities and learning centers. Classes may be added as enrollment demands. We are always available to discuss your questions and concerns about registration and class placement. This Young Threes class is for children who have turned 2 years, 9 months old by September 1st. It offers children their first learning experience away from parents. Children engage in self-initiated play in a small group with teachers who foster self-help, self-regulation and social interaction skills. This class is for children who have turned 3 years old by September 1st. It offers developmentally appropriate activities that promote a strong sense of self, nurture social competency and introduce early school readiness skills. This class is for children who are 3-1/2 years old by September 1st. It offers more opportunities to engage in social interactions and activities that are developmentally appropriate for an older child. These classes are for children who turn 4 by September 1st. 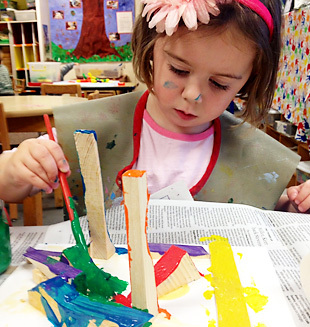 They offer hands-on, developmentally appropriate activities that support Kindergarten readiness skills and build on the child’s positive sense of self and social competency. This class is for children who will turn five prior to December and can be an important transition year for a young Five needing additional growth and development before entering Kindergarten. Classes may be added as enrollment demands. EARLY DROP OFF (8:30 to 9:00) and LATE PICK UP (3:30 to 4:00) available each day for extra play before and after school. 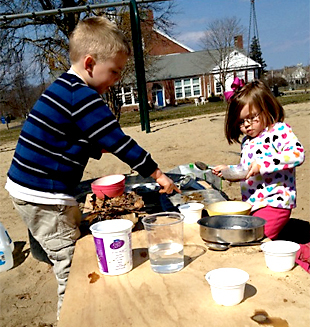 LUNCH BUNCH (11:30 to 1:00) teachers and parents supervise outdoor play, lunch, free play and stories. • EXPLORERS focuses on nature-based curriculum for children in our Fours classes. • IMAGINEERS offers STEAM activities integrating science, technology, engineering, arts and math. For all ages. • BOOKWORMS enjoy lively literacy activities to foster a love of letters, words and books. For all ages. STAY AND PLAY (1:00 to 3:00) gives all children a chance for more free play with their friends. Registration for the 2019/20 School Year will begin on October 22, 2018. Erdman families will have preference until November 4. New families will be placed beginning on November 5.